The American Heart Association recommends that we eat fish at least twice a week, since fish are high in protein, low in saturated fats and rich in omega-3 fatty acids. Global per capita fish consumption has almost doubled from the 1960s to 2012. And today, about half of all the seafood destined for human consumption is produced through fish farming, also called aquaculture. The Food and Agriculture Organization of the U.N. (FAO) projects that by 2030, aquaculture, one of the fastest growing methods of producing food in the world, will be responsible for almost two-thirds of the fish we eat. 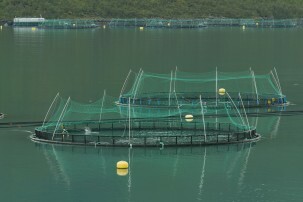 The most common type of aquaculture is farming in net pens or cages anchored to the sea floor in the ocean near the coast. There are also closed systems of tanks or ponds that float on water or operate on land. The FAO estimates that over 600 aquatic species are produced globally in a variety of aquaculture systems using freshwater, brackish water or salt water. In the U.S., over 91 percent of the seafood we eat is imported. 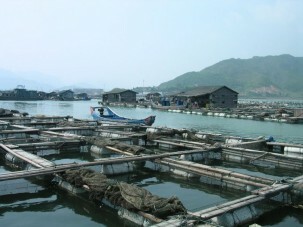 China is the largest exporter of fish globally, the third largest importer of fish and the biggest aquaculture producer. As early as 2500 B.C., the Chinese practiced fish farming, putting carp in rice paddies where they ate insects and weeds, fertilized the rice, and then were eaten. Today, 88 percent of the world’s aquaculture comes from Asia. While fish are known for their omega-3 fatty acid benefits, they do not actually produce omega-3s themselves. Microscopic algae that live in fresh or salt water or sediments produce them. Herbivorous fish and forage fish like sardines, anchovies and herring obtain omega-3s by eating the microalgae. Larger carnivorous fish such as salmon or sea bass then eat the forage fish. Because salmon and other popular carnivorous fish need omega-3s to grow, 30 to 50 percent of the fish feed traditionally used for these species consists of fishmeal (ground fish) and fish oil. 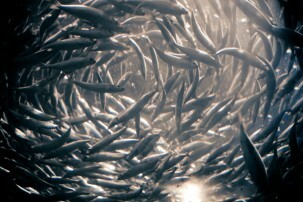 Over 50 percent of the world’s fish oil is used in feed for farmed salmon. This is one reason that aquaculture has a reputation as being unsustainable. In 1997, it took almost 3 tons of forage fish to produce one ton of salmon. A third of the global fish harvest still goes toward making fish meal and fish oil. As a result, forage fish are being overfished, and some populations have crashed, which has implications for the entire food web since larger fish depend on them for food. Most fish farming methods are harmful to the ecosystem in other ways as well. Fish waste and left over food spill out from nets into the ocean, causing nutrient pollution. This may lead to oxygen depletion in the water, which can stress or kill aquatic creatures. 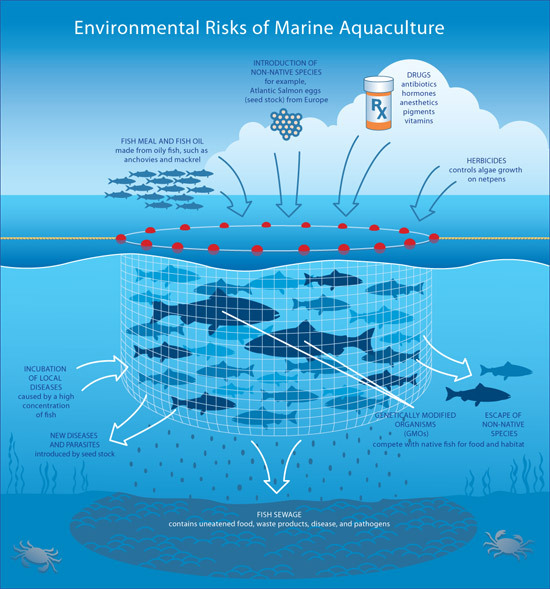 In addition, antibiotics or pesticides used on farmed fish can affect other marine life or human health. These nutrients and chemicals also sink to the ocean floor, where they may impact the biodiversity there. Fish crowded together in nets or pens are more susceptible to stress, which can foster disease and parasites that may then spread to wild species. Farmed fish sometimes escape into the ocean, breeding with wild species and affecting the population’s overall genetic diversity. Land-based closed systems minimize the amount of waste and nutrients expelled to the environment, eliminate fish escapes and limit the spread of disease; but pumping the water through them requires a great deal of energy, and the wastewater must still be disposed of properly. Aquaculture has also resulted in land conversion for feed and the destruction of ecosystems. To grow the soybeans used in herbivorous and other fish feed, vast areas of South America, almost 4 million hectares of forest, are razed yearly and converted to agricultural land. Growing the soybeans also depends on water availability. Shrimp farming, which is usually done in salty coastal waters, has been responsible for the destruction of 38 percent of the world’s mangroves. Mangroves have critical ecological functions including providing food and habitat for many species, preventing erosion, sequestering carbon, and offering protection from storms. Moreover, many shrimp ponds accumulate shrimp waste, antibiotics and pesticides, and without mangroves to filter them, eventually become unusable. 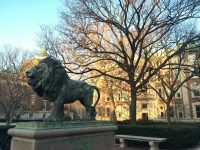 But Pete Malinowski, former aquaculture director of the New York Harbor School and director of the Billion Oyster Project, which aims to restore one billion live oysters to New York Harbor, thinks aquaculture’s bad reputation is undeserved. One strategy involves moving aquaculture out into the open ocean where the water is pristine and currents are strong and steady enough to continually flush the farms of fish waste and pests such as sea lice. The open ocean also provides farmed fish with more consistent salinity and temperature. This means they are less stressed and less vulnerable to disease, which promotes better growth and minimizes the need for antibiotics or vaccines. Open Blue Sea Farms grows cobia (related to remoras) in the largest open ocean farm in the world. After the fish develop in the hatchery, they spend 14 months in huge submersible pens deep below the surface in clean ocean waters seven miles off the coast of Panama. Steve Page of Ocean Farm Technologies co-designed the Aquapod , a geodesic dome large enough to accommodate several hundred thousand fish. Kampachi Farms off the coast of Hawaii is using the Aquapod to grow kampachi (related to yellowtail), after successfully mounting the Velella Project. The project researched the viability of farming fish in an Aquapod tethered to a drifting boat in deep water. It had no measurable impact on the environment. Because satellite communication was not robust enough to handle the remote controls needed to manage the drifting Aquapod, however, Kampachi Farm is now using an Aquapod attached to a barge out in the ocean. In the future, Aquapods could potentially be equipped with propellers and a GPS system, and used to transport juvenile fish to arrive at their destination with the fish ready to harvest. On land, some fish farms are using recirculation systems to recycle their water. Recirculation systems use 100 times less water per kilo of fish than traditional land-based systems. In addition, the water quality can be monitored continuously, which lessens the risk of disease and the need for antibiotics. 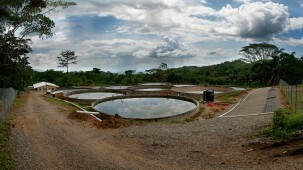 Denmark is a leader in recirculation system aquaculture. Hallenbaek Dambrug raises rainbow trout while recirculating over 96 percent of its water. The discharge wastewater is filtered, and the sludge used for biogas or fertilizer. The discarded water is treated to remove nitrate. Anadramous fish like salmon and trout are born in fresh water then migrate to the ocean, returning to freshwater to spawn. Salmon and trout are typically raised in fresh water until they are mature enough to migrate to salt water, where they are farmed in sea cages. But some new recirculation systems allow these fish to spend their entire life on land by alternating fresh and salt water environments through controlling the water chemistry. 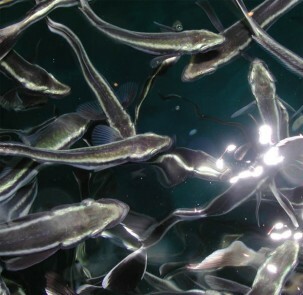 Scientists at the University of Maryland Department of Marine Biotechnology developed a recirculation system that facilitates predictable reproduction in farmed fish, one of the main challenges of aquaculture. The system recycles 99 percent of its water, filters waste through microbial communities and produces methane as a biofuel. By changing water temperature, lighting and salinity levels, and then feeding the fish a pellet that mimics a hormone prompting reproduction, the scientists have been able to get the fish to reproduce in predictable cycles. RDM Aquaculture, an indoor saltwater shrimp farm in Indiana, has recycled the same water for five years, produces zero waste and uses no chemicals. Its “heterotrophic biofloc system” allows all organic matter—shrimp waste, bacteria, microalgae, shrimp shells and dead shrimp—to remain in the water. The shrimp eat what they need to eat and the bacteria feed on their waste. 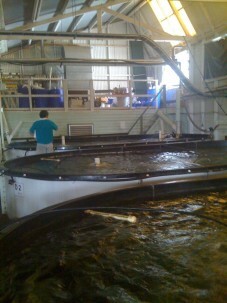 An Integrated multi-trophic aquaculture site at Cooke Aquaculture Inc. in the Bay of Fundy, Canada: salmon cages (left), mussel raft (right foreground) and seaweed raft (right background). Thierry Chopin, professor of marine biology at the University of New Brunswick, combines species from different levels of the food web in a practice called “integrated multi-trophic aquaculture.” Working with Cooke Aquaculture in New Brunswick, Canada, Chopin places blue mussels and kelp downstream from salmon pens. The mussels feed on wastes from the salmon while the kelp take up inorganic nutrients. Sea urchins and sea cucumbers consume larger particles on the ocean floor. Cooke’s salmon and mussels are sold as food, and its seaweeds are used in restaurants and cosmetics manufacturing. A Dutch and Vietnamese industry group along with universities and research organizations is designing a “nutritious-system” concept of aquaculture in Vietnam that utilizes the natural ecosystem of a pond to farm fish or shrimp and get rid of the waste. The project studies how omega-3 fatty acids are produced and will determine the right balance of algae and bacteria to ensure the best water quality, nutrition for fish and shrimp, and decomposition of waste. The rising prices of fish feed and the environmental impacts of over-exploiting forage fish for feed and fish oil have led to an increase in the farming of herbivorous fish (such as carp and tilapia) and omnivorous fish (barramundi) that require much less fishmeal to produce protein. Meanwhile, research is also ongoing to find alternatives to fishmeal feed or ways to make it more sustainable. Kampachi Farm has experimented with fish diets supplemented with soybeans and plant waste, and replacing fish oil with microalgae and yeast products. In 2013, Kampachi tested three feeds containing no fishmeal at all, and found them all comparable to the standard diet. Researchers at the University of Maryland Center for Environmental Science developed fish feed made completely with corn, wheat and soy. The fish oil was replaced by fatty acids from algae, amino acids and soybean or canola oil. PCB and mercury levels in the fish were 100 times less than those in fish eating fishmeal feed. This is because fishmeal and fish oil in feed can transfer environmental pollutants to farmed fish, while feed made of ingredients from vegetation can reduce them. British scientists genetically modified camelina sativa, a plant known for its seed oil, with synthesized genes from algae, enabling the plant to produce omega-3s that successfully replaced fish oil in fish feed; the salmon thrived. A Texas A&M University scientist is using distillers’ dried grains with solubles, nutrient-rich grains made in ethanol production, as a cheap source of protein in shrimp feed. He has successfully substituted sorghum and corn distillers’ dried grains for 10 percent of the protein in shrimp feed. Calysta, a California based company, is developing protein for feed using bacteria that are fermented and fed methane gas, in a process similar to making beer or bread. The product, called FeedKind, is a natural high-quality protein fishmeal replacement. Researchers from Wageningen University in the Netherlands are experimenting with insects as a new source of omega-3 fatty acids. The scientists extracted the naturally produced oil from a variety of insects and are researching the breeding, optimal diet and processing of the insects for oil. A 2014 FAO paper concluded that insect meal could replace between 25 and 100 percent of soymeal or fishmeal in fish diets with no adverse effects. In 2010, only 36 percent of fishmeal came from the trimmings and waste (heads and innards) of fish fillets, which are usually discarded. China increasingly relies on wild-caught fish for fishmeal and fish oil. A Stanford University study found that using the waste from seafood processing plants, and adding algae or ethanol yeast to boost the protein content (since waste has less protein than wild-caught fish), could replace half to two-thirds of the current fishmeal used in Chinese aquaculture. Finding the best formulas for fish feed also means trying to achieve the lowest feed conversion ratio—the amount of feed given in relation to the amount of weight gained by the fish. For example, Malinowski explained, tilapia can produce a pound of protein on less than a pound of food, while salmon require a pound and a half of food to produce a pound of protein. As the global population grows to 9 billion by 2050, more people enter the middle class, and fisheries are overexploited, aquaculture will be critical to supplying the protein the world needs. How Do We Make Sure Aquaculture is Sustainable? 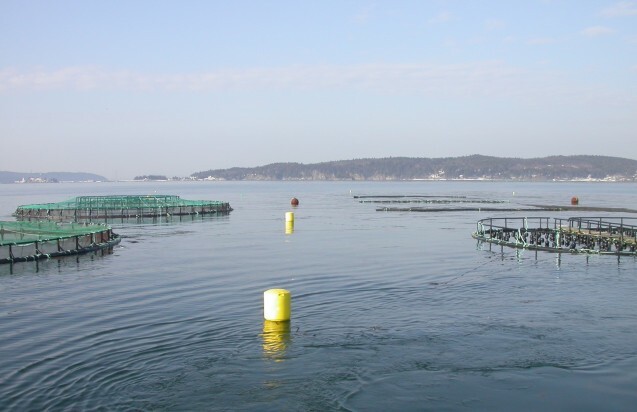 Because there are a number of different international and national certification schemes for aquaculture, the FAO developed technical guidelines for aquaculture certification and an evaluation framework. But while environmental impact assessments and certification are required for many large fish farms, they are not required for small farms, many of which are unsustainable. 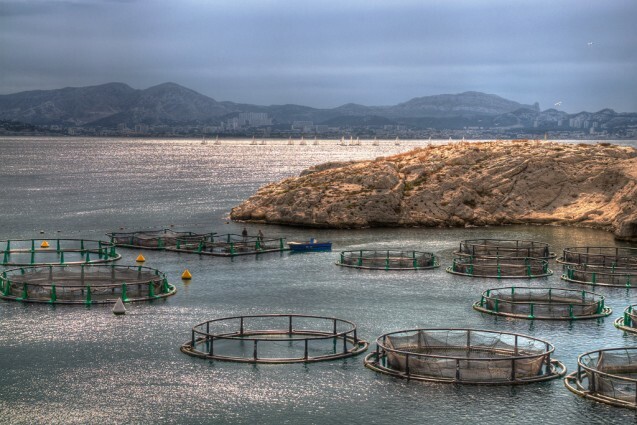 Regulations governing responsible aquaculture development in many countries are weak. The Global Aquaculture Alliance developed the voluntary Best Aquaculture Practices Certification. The standards address environmental and social responsibility, animal welfare, food safety and traceability. The Aquaculture Stewardship Council, founded by the World Wildlife Fund and the Dutch Sustainable Trade Initiative, also aims to make aquaculture environmentally sustainable and socially responsible. Its goal is to be the global leader in certifying responsibly farmed seafood and managing global standards for sustainable aquaculture. The World Wildlife Fund, the FAO, the World Bank, and others formed the Shrimp Aquaculture and the Environment Consortium to adopt international principles for responsible shrimp farming. The SNV Netherlands Development Organization and the International Union for Conservation of Nature launched the Mangroves and Markets project in Cà Mau, Vietnam, to promote sustainable shrimp farming. The project provides training to farmers on breeding and marketing sustainably certified shrimp, promotes the replanting of mangrove forests, and helps shrimp farmers get certified in carbon markets. These shrimp farms must have 50 percent mangrove growth or more. In a sign of the ongoing growth of aquaculture, NOAA Fisheries recently published a new rule, opening up federal waters from three to 200 miles offshore in the Gulf of Mexico to aquaculture. To make sure you are choosing sustainably farmed seafood, visit Seafood Watch. A new report, The State of Sustainability Initiatives: Standards and the Blue Economy analyzes the market and performance characteristics of international sustainability standards operating across both the wild catch and aquaculture sectors. I am Pinkeshwar Kumar from India and i am interested for fish farming. Kindly can u help me with how to biofloc for fw fish.